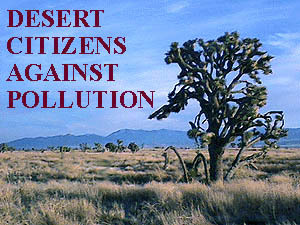 Desert Citizens Against Pollution was formed in 1986 after it was discovered by Antelope Valley residents that a neaby cement kiln burned all the liquid incinerable, hazardous waste in California. This cement kiln, National Cement, is located near Gorman. Local residents were concerned about the adverse health effects that might be caused from the plants emissions. Local citizens in the western portion of the Antelope Valley had noticed that many families were experiencing similar health problems: headaches, respiratory problems, a metallic taste in their mouths, and other symptoms. These concerns caused them to look at environmental factors to the illnesses. The emissions at National Cement of dioxin, furans, heavy metals, and volatile organic compounds were suspected of contributing to these health problems. Since that time, DCAP has been involved in many pollution issues affecting the desert including landfills, tire burning in cement kilns, nuclear waste transport and dumps, gold mines, hazardous waste dumps, and protecting critical habitat for the endangered desert tortoise. DCAP has four board members, Lyle Talbot, Roland Valentine, Walt Ranger, and Jane Williams. All are longtime Antelope Valley residents. National Cement stopped burning hazardous waste in August 1997.